When feeling that I need to justify being in a CAE bookgroup when, heaven knows I surely have enough reading that I should be doing, I often say “Well, you read books that you wouldn’t normally choose”. This is very much the case with this book. As it happened I didn’t really mind sinking into its fairy-floss peaks, aware that I had only two days to read it before our bookclub meeting. I’d just finished reading N and was feeling exhilarated and supremely sated, and I would have found it difficult to turn straight away to a challenging or complex book. Fortunately, in this case then, The Life and Times of the Thunderbolt Kid is neither of these things. I’ve read a couple of Bill Bryson’s travel books, and find them wryly amusing. Although this is a memoir, he approaches it in much the same way: it is a travelogue around his childhood memories. The book moves chronologically towards his adolescence, but is structured thematically with chapters titled (among others) ‘Hometown’, ‘Welcome to Kid World’ ‘Birth of a Superhero’ ‘Boom!’,’What, Me Worry?’ and ‘The Pubic Year’. Bryson was born and raised in Des Moines Iowa in 1951. Unusually for the time, both his parents worked at the Des Moines Register, his father as sports writer and his mother in the women’s section. 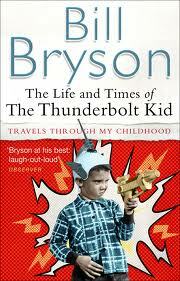 Bryson’s viewpoint is unashamedly child-centred, with his parents benign but almost peripheral characters, and his sibling almost invisible. Bryson is much attracted to lists, and they pepper the book- a rather lazy way, I think, of leaving the reader to recognize and make the connections. There are one-liners on every page, and it’s the voice of the raconteur that you hear. One of the things that struck me was how self-containedly American his life was. He lists his favourite television programs (all American), films (all American), comic books (all American) and school readers (all American). It reinforced for me how much an Australian childhood (albeit five years later than his) was a mixture of British, American and Australian influences. This is not to say that there’s not some social commentary in here as well. He points out the disjunction between the fears of the time (polio, Communists, nuclear war) and the sunny abundance and self-confidence of affluent, middle class White America. He deals with racism in a couple of pages because it was not on his horizon at all. All in all, it’s an affectionate, humourous wallow in nostalgia. It reminded me a bit of the television show ‘The Wonder Years’. I enjoyed it in half-hour episodes but I know I would have drowned in schmaltz had it gone on for an hour. Like a sit-com or a travel book, this book could have stopped ¾ of the way through, or gone on for another 100 pages, although at nearly 400 pages I think that it was plenty long enough. What a wonderful world it was. We won’t see its like again, I’m afraid. This entry was posted in Baby boomer stuff, Book reviews, The ladies who say ooooh and tagged Bill Bryson, The Life and Times of the Thunderbolt Kid. Bookmark the permalink.